Great white shark breaches cage off coast of Guadalupe Island in Mexico. A terrifying video that appeared online and went viral this week will have "Jaws" fans thinking twice about the implications of a real-life close encounter. 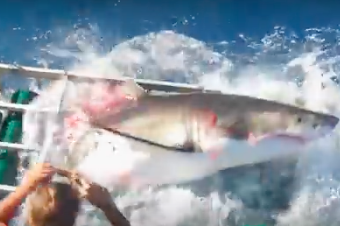 The accident occurred off the coast of Guadalupe Island in Mexico, where a California man filmed a video of the shark breaching the cage enclosure. Initially, the man shooting the video is unaware that there's a diver inside. Ming Chan, the Shanghai man later identified as the diver, said he has no plans to find a new line of work, according to Yahoo News. The shark evidently broke the cage while lunging at tuna bait, and since he couldn't swim backwards, he flopped through the top of it. Blood appearing in the video may be from lacerations from the cage's broken metal rail. Like Ming Chan, the videographer said he hopes to return to film future scenes at shark-infested waters.